The newest Virginia-class attack submarine, USS Colorado (SSN 788), will be commissioned at Naval Submarine Base New London, March 17, 2018. It will be the 15th Virginia-class attack submarine to join the fleet when it is commissioned, which you can watch here on the Navy Live blog. Below are five things that you should know about the Navy’s newest submarine. The Virginia-class, fast-attack submarine, USS Colorado (SSN 788) is equipped with non-penetrating digital camera periscopes called Photonics Masts. Normally, submarines are built with two classic style periscopes. The Technical Insertion called TI-14, and Advanced Processing Build APB-13, allows the Photonics Masts the option to be controlled with wired video game controllers. Though others have tested prototypes, Colorado is the first submarine operating from the start with the gaming controllers. 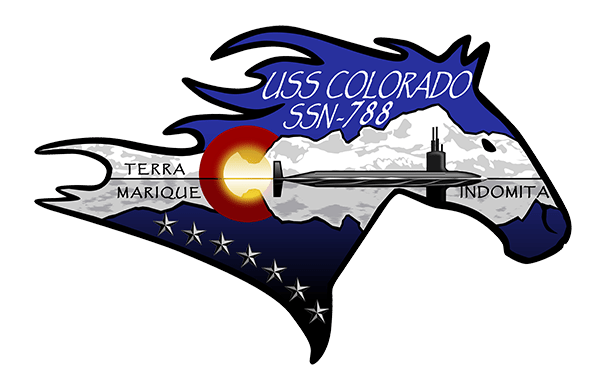 USS Colorado’s (SSN 788) crest was designed during a contest held by Colorado’s Commissioning Committee and USS Colorado. Many submissions came in, and the winning design selected was submitted by Ens. Michael Nielson, who, at the time, was a student at the Navy’s Nuclear Power Training Unit in Ballston Spa, New York. After contacting Nielson to let him know that his design was selected, USS Colorado found out that he was actually from Arvada, Colorado. Two days after finding out he won the design contest, he received orders to report to USS Colorado. USS Colorado (SSN 788) is the third ship to bear the name of our 38th state. The first Colorado, named after the Colorado River, was a steam screw frigate that launched in 1856 and commissioned in 1858. Her service included serving as flagship to Commodore William Marvine while he ran a blockage squadron during the Civil War. During the Battle of Fort Fisher in Wilmington, North Carolina, she was pivotal in the fort’s capture. The battle was heralded by the New York Times as “The Most Beautiful Duel of the War.” The first Colorado was decommissioned June 8, 1876. The second ship was a Pennsylvania-class cruiser. She was commissioned in 1903 and joined the Atlantic Fleet in 1905. She was ordered to the Asiatic Station where she saw service in China and Japan as well as the Hawaiian Islands and Mexico. In 1916, she was re-commissioned under the name USS Pueblo so the name Colorado would be free to use on the Colorado-class battleship. She was decommissioned in 1927. The third USS Colorado (BB 45) was the lead ship in the Colorado-class of battleships and she served our Navy from 1923 to 1947. Battleship Colorado engaged in combat in the Pacific, supporting landings on Tarawa, Kwajalein, Eniwetok, Saipan, Guam and Tinian. During the Battle of Tinian, she was hit 22 times by shore batteries but stayed in the fight. Colorado continued to serve bravely in Leyte, Mindoro, Luzon and Okinawa. In the Philippines, on November 27, 1944, she was hit by two kamikazes which caused moderate damage. She earned seven battle stars for her service in the Pacific and continued to serve valiantly throughout the war. When the unconditional surrender was signed aboard USS Missouri, Colorado stood guard proudly in Tokyo Bay. She was decommissioned on January 7, 1947. USS Colorado galley is named “Rocky Mountain Grille.” This name was selected after a naming contest at the command. The crew’s mess and the serving line in front of the galley are adorned with landscape photographs by John Fielder, a photographer in Colorado. The photos were given and installed by USS Colorado’s Commissioning Committee. The photographs remind Colorado Sailors of the great people of the beautiful state they represent. A Colorado Sailor, Sonar Technician (Submarine) 3rd Class Brayden Kane, was awarded his Submarine Warfare Insignia, referred to as “dolphins,” by retired Lt. Col. Andy Palenchar at the Colorado State Capitol building. Palenchar enlisted in the Navy and qualified aboard USS Finback (SS 320) in 1943. While USS Finback was deployed, serving “lifeguard duty,” rescuing downed Navy pilots, Palenchar was the one who hoisted a pilot named Lt. j.g. George H.W. Bush aboard after the future president was shot down over the Pacific. After World War II, Palenchar joined the Army and retired as a lieutenant colonel in 1978. This entry was posted in Navy Live and tagged Inside the Navy, Undersea, USS Colorado. Bookmark the permalink.